(TibetanReview.net, Dec22, 2017) – A delegation of the Tibetan Parliament in Exile led by Deputy Speaker Acharya Yeshi Phuntsok has met with 35 members of the Indian parliament during this week to lobby for support for the issue of Tibet, said the Central Tibetan Administration at Dharamshala on its Tibet.net website Dec 22. The Indian MPs are attending the winter session of their parliament. The MPs belong to five major political parties, hail from 14 states, and belong to both the Upper and Lower Houses of the parliament. Acharya Yeshi Phuntsok has said his delegation of three, which had arrived in New Delhi on Dec 18, was focusing mainly on new members of the Indian parliament which has a total strength of 543. The Tibetans briefed the Indian lawmakers about the Tibetan freedom struggle with a view to elicit their support for the Tibet issue. 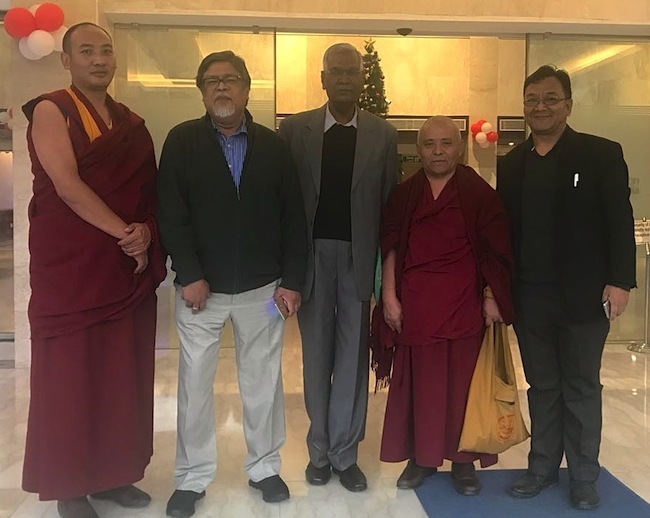 The delegation sought to encourage the Indian MPs to participate in the All-India Parliamentary Forum for Tibet (AIPPFT) in order to bolster its Tibet advocacy agenda both in the parliament and at other forums. Their attendance at an upcoming AIPPFT meet and the 7th World Parliamentarians’ Convention on Tibet was also sought. In this connection, the delegation met with former Himachal Pradesh Chief Minister Mr Shanta Kumar and his fellow-senior BJP leader Mr Bhagat Singh Koshyari who are the chief Conveners of the APIPFT to discuss the holding of the groupings 5th conclave. The Indian MPs were reported to be warm in their responses and full of admiration and praise for Tibet’s exiled spiritual leader, the Dalai Lama, while promising strong support for and solidarity with the Tibetan cause. The Indian MPs were also stated to have lauded the spirit of spirit of the Tibetan people in Tibet and exile in carrying forward their freedom struggle over the past 60 years. The other members of the delegation are Lopon Thupten Gyaltsen and Mr Lobsang Yeshi.